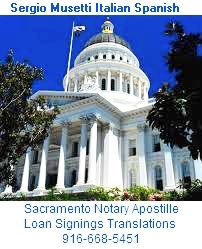 Besides general 24 hour Mobile Notary Public service at any location in West Sacramento or 30 miles from it, other services are provided: language Spanish English translation, California Apostille (Apostilla, Apostillado), certification, and authentication at the Secretary of State, consulates and embassies, certified Signing agents catering to escrow officers, lenders, banks, loan officers, processors, title companies, banks, mortgage brokers, realtors, loan consultants, real estate agents with legal, financial, Real Estate, business and personal documents. Servicelink Notary Signing Agent Training completion certificate. 2013. 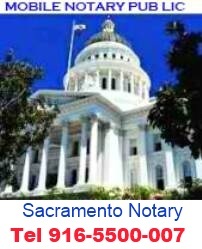 Sacramento Mobile Notary Public. 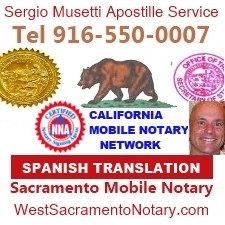 Meet a traveling notary at your location, office, residence or any public place in town. Contact Sergio Musetti to setup an appointment.